Ashton Golding touches down against Leigh. Leeds Rhinos moved into the semi-finals of the Challenge Cup thanks to 52-22 victory over Leigh Centurions on Friday night at Featherstone. 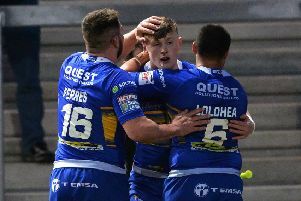 Ashton Golding celebrates his try with Tom Briscoe and Brett Ferres. Richie Myler scores against Leigh.